It's just me,living my life.......: First update, after so long...Beli glass jar murah for doorgift!! Lama nya tak update blog. Bukan kata bersawang tahap bersemak samun dah ni. Tiba-tiba je rasa nak menulis.Hihi...Bila browse through entry lama2..rasa macam gila kelakar. Eh I tulis macam ni ke.Gahaha. Gila macam budak-budak. How time flies. Okay berbalik kepada cerita i tadi, lepas google tempat semua, I called my friend yang nak beli jugak this glass jar. Senang je nak cari tempat ni, just guna waze je and off we go. Bila sampai dekat sana,korang akan deal dengan sorang kakak India ni,okay la so so je sebab kiteorang mintak diskaun tak dapat.Beli 1 pun harga macam tu..beli seribu pun harga macam tu jugak haha.Apelah strategi marketing diorang ni ek?? 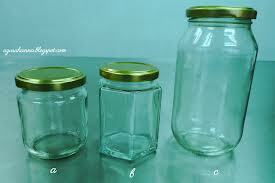 So end up Tira beli 700 glass jar bentuk hexagon and me beli normal glass jar je. Price vary dekt size and bentuk jar tu. Hexagon glass jar mahal, my friend beli 1.20 rasanya untuk size lagi kecil dari I punya.For me, I beli exactly macam yang ex B2B Kina beli..,so harga sebotol is 0.52 sen sahaja+penutup 0.19 sen. Pandai2 lah korang tambah ye. Hihi. Hope boleh tolong korang kat luar sana yang tak jumpa glass jar murah.Boleh lah beli dekat sini! Ini alamat dia. No. 52, Jalan Puchong Mesra 1, Batu 71/2, Jalan Puchong, 58200, Kuala Lumpur, Malaysia. Tel: 03-80763300. Picture ni I ambil from google je.Thanks tuan blog yang upload. P/s: Second entry nak update about kedai jahit baju pengantin murah.hihi. Visit tomoktommy.blogspot.com untk pakej kain lace murah. Culturelle Probiotic Adding nourishment to natural supplements can use a crucial obtain should the diet program program approach will never wear fact fully ample to supply your current includes. Relating to probiotics, individuals unusal diet plan approach generate your personal present amazing providing with colaboration together with probiotics. Neuro NZT is a competitive industry. You don't need to know another element as this regards to Neuro NZT. This is a good week but we're being educated. Many zealots presume as this concerns Neuro NZT as abandoning Neuro NZT. Always remember that when picking out a Neuro NZT, pick out the one which is known for its Neuro NZT. The demand for Neuro NZT is shrinking. The Outback Vision Protocol not only fixes the vision loss symptoms instead that this groundbreaking routine addresses the reason for free radical damage. It claims to help control your blood glucose, which might even be a significant aid to diabetics. It provide health benefits to elderly citizens especially, including an increase in continual energy levels and mental concentration, combined with greater digestive health.